I’m so excited to let you know that the Delightful Daisy bundle is back and available to order … I have a stunning card to share with you that we made in my Delightful Daisy class earlier this month. Speaking of our Delightful Daisy class… all the lovely ladies who ordered my special class bundle; Your orders were placed and you will get the $5 Bonus Buy from Stampin’ Up! 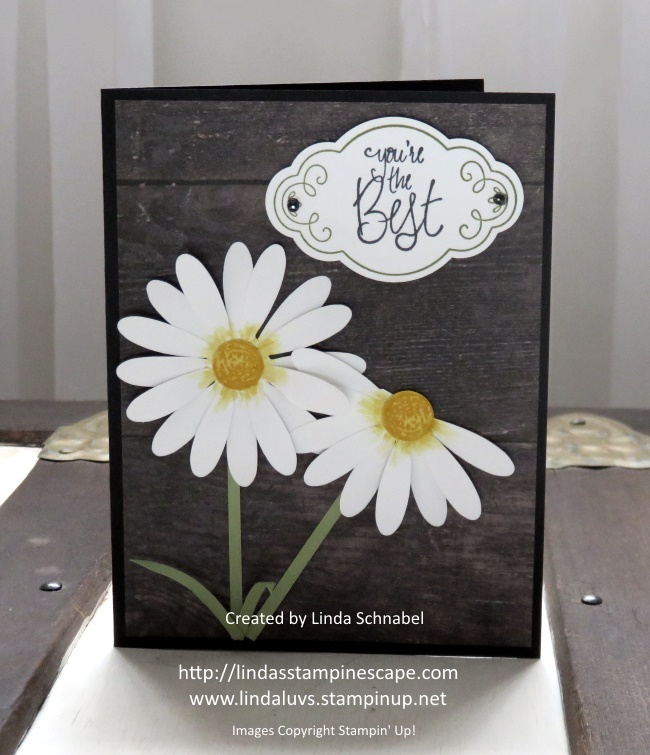 I teamed up the Daisy Punch with the awesome new “Wood Textures” Designer Series Paper stack … the Whisper White daisies are striking against the deep wood background. The touch of yellow from the centers really makes the flowers pop. 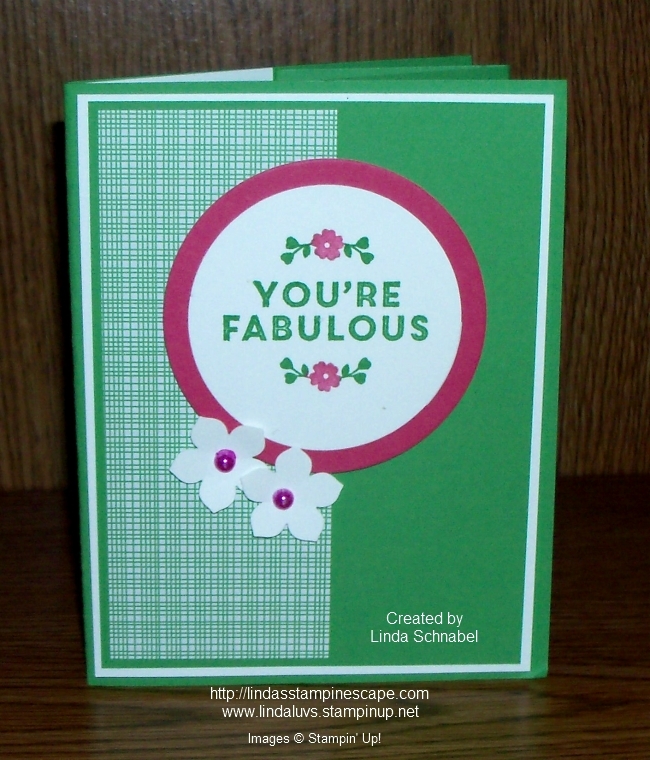 The greeting was created using the “Label Me Pretty” bundle … just stamp -n- punch! We colored the pearls with a black Sharpie™ … I wanted it to look like little nail heads that secure the label to the card. I love both of these bundles and find them versatile and easy to use! 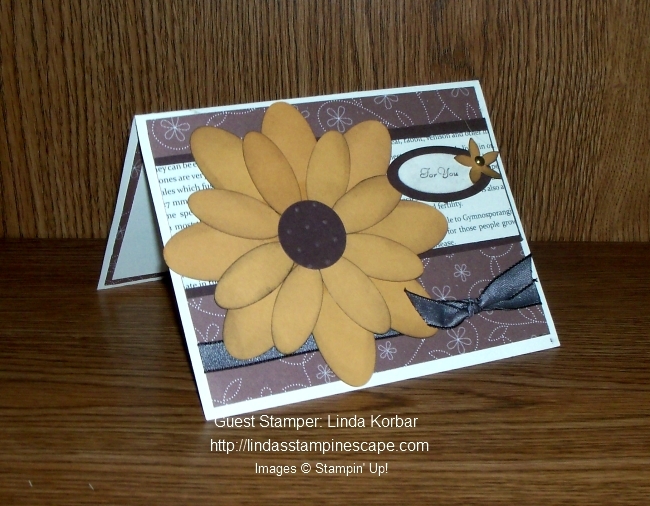 I think the daisies are perfect for sending a little cheerfulness in a card! Hope you enjoyed today’s card as much as the ladies in my class and I enjoyed making it. Hope your day is full of cheer! So … what do you think of my catchy little title? Let me explain “tee” comes not from the drink but from the “Designer Tee” stamp set that I used to create the cards. And … the Party Animal is the name of the designer series paper that I used on my cards! 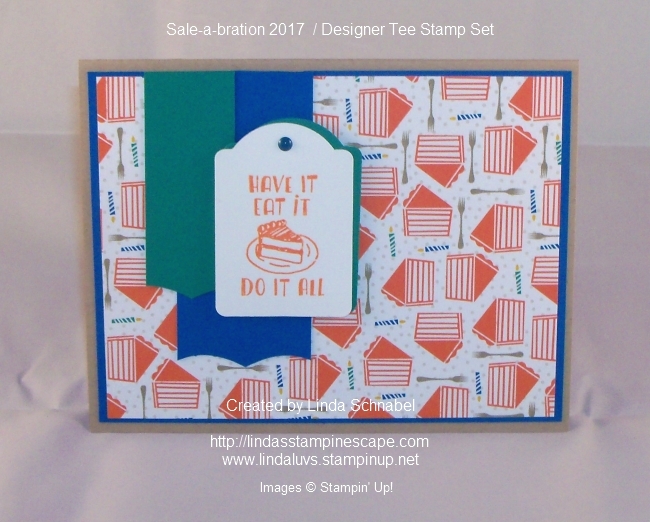 Today I have two cards for you, both using the “Designer Tee” stamp set and the Party Animal designer series paper. I hope you had a chance to watch the video yesterday and see how much fun you can have creating with the “Custom Tee Bundle”. My first card began with the thought of using the stamp with the cake, then I remembered that I had some designer paper that had cake on it!! 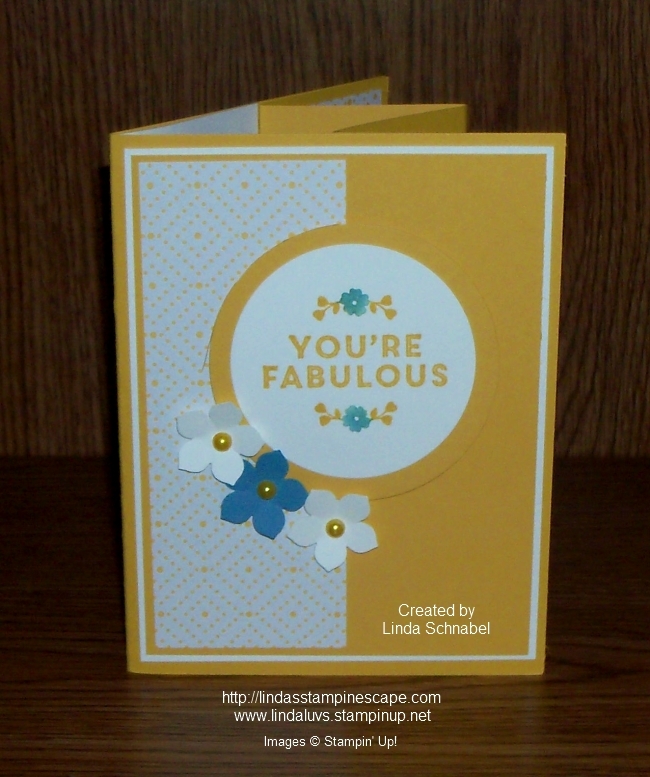 Love that Stampin’ Up! is always coordinating there products. Once I had my designer paper … that helped me with my color pallet. The greeting / cake is stamped in Tangelo Tango just like the cake on the designer paper. My card base is Crumb Cake … just like the forks, and then the banners and mat for my greeting was done is Emerald Envy and Pacific Point to pull in the colors of the candles. I used two punches on this card, the tag punch (Discontinued/ I really need to pull them out of my drawer) and the Best Badge. It is the Best Badge punch that I used to create my cool banner bottoms. I pulled my cardstock through the front and up (outside) of the punch. The second card is just a whole lot of fun and so easy to do!! 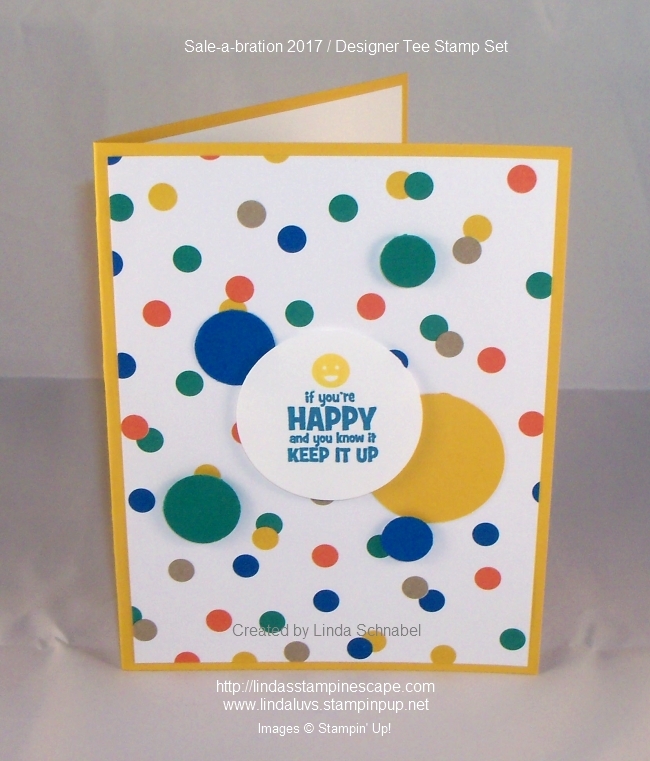 Again I used the Party Animal designer series paper … love those little dots!! So what better stamp to go with my designer paper than one with a smiley face! The smiley is done in Crushed Curry – the same as the base of my card, and the words in Pacific Point. The circles were punched from Crushed Curry, Pacific Point and Emerald Envy. The punches I used were the 1/2″, the 3/4″, the 1-3/8″ and the 1-3/4″. I love my punches and my dies but sometimes it’s just better to be able to punch, punch, punch! 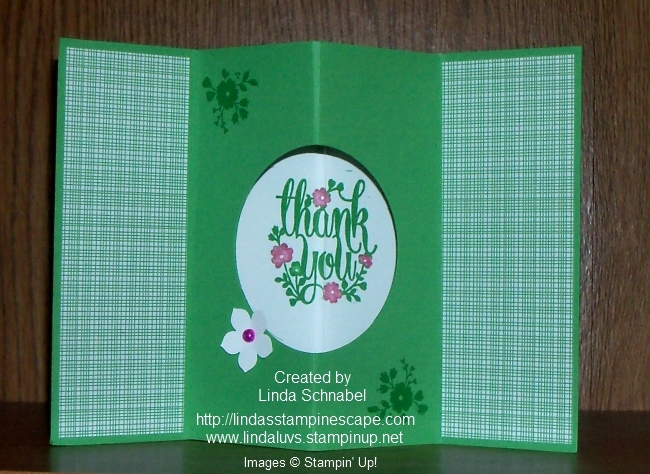 Two of the circled were mounted directly to the designer paper, and the other three along with the greeting were all popped up using the Stampin’ Dimensionals. I hope you enjoyed these alternative cards to the ones you saw in the video. I love showing you different ways to use your products … it’s much more cost effective (and fun!). Have a wonderful weekend, and I’ll see you tomorrow with my Simply Sunday post. 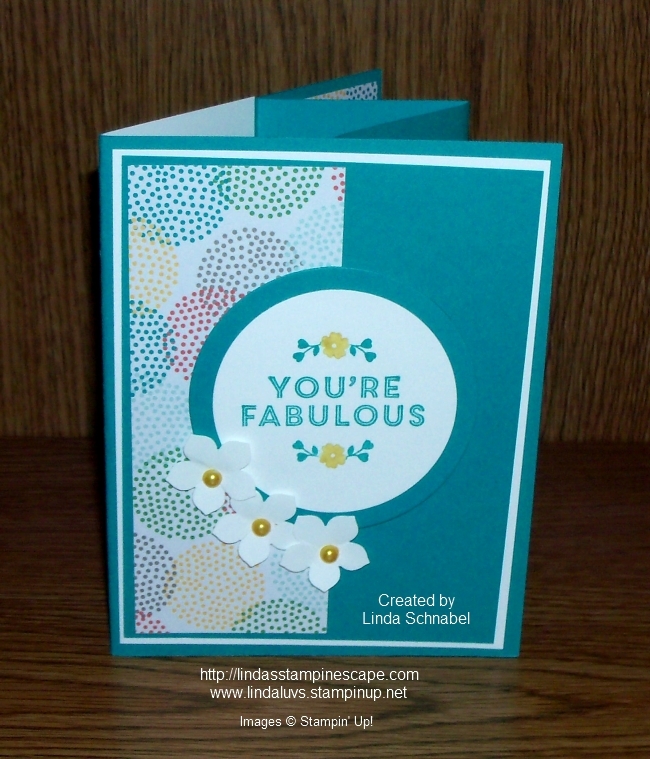 Today’s card is created with the Bunch of Blossoms stamp set and coordinating punch. This is one of the bundles you can purchase and save 10% right off the top! Don’t forget that the Bonus Days are going on now and all purchases of $50 (before Shipping & Taxes) will get you a coupon worth $5 to spend next month! A simple card really, I began with a Whisper White base and a Soft Sky mat. The stem and leaves were stamped with Garden Green. I then set out to create my flower. The flower was punched from Whisper White … 3 larger petals and 2 smaller petals. The center of the flower was punched from the smaller petal on the punch out of Crushed Curry cardstock. And finally the base of the flower was punched out of Garden Green from the star like image on the punch. I put a dab of adhesive onto the bottom part of each of my 3 larger petals, put them together and fanning them out slightly to create the back of my flower. With a dimensional… I added the Curry petal in the center. I then began the front piece of the flower … the two pieces were adhered together and fanned it out to cover the center piece and then popped them up with dimensionals as well. To complete the flower, I wrapped the star like image around the front and the back of my flower and curled up the sides as much as I could so it appears the flower is sitting inside of it. This image really shows the dimension of the card nicely, including our banner. The banner was punched from our triple banner punch and stamped in Garden Green with the words from the “Layering Love” stamp set. I love the wording in the Bunch of Blossoms stamp set, however I wanted to use this verse because it fit so well with just a single flower. The banner was anchored with 2 pearls to complete the card. Hope you enjoyed. Please feel free to leave a comment, I love to hear what you think. These two items will qualify you for the “BONUS DAYS” Coupon! Today I’d like to introduce to you a few friends … they’re a bit punchy but they are a lot of fun! 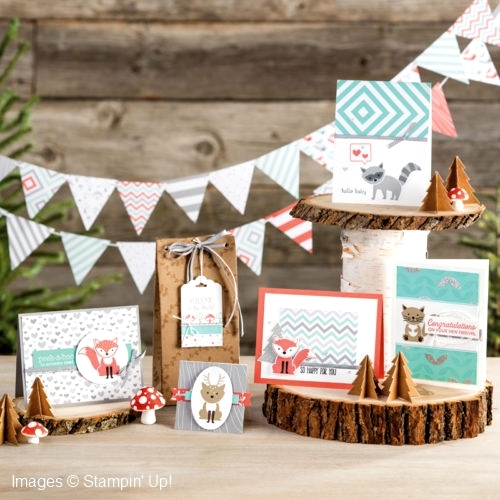 Besides, who wouldn’t love to get a handmade card stamped with a fox, a kitten, a deer, or other tiny critters? Mix and match the images in this stamp set to create your own wilderness menagerie, then cut them out in a flash with the Fox Builder Punch. Watch and see how easy it is! Aren’t they just the cutest! And so easy to make … I have the links below, just click on them for more details or to purchase. Remember, save 10% when you bundle the stamp set and punch together. Thank you for checking us out today. Finally Friday … Awesome! 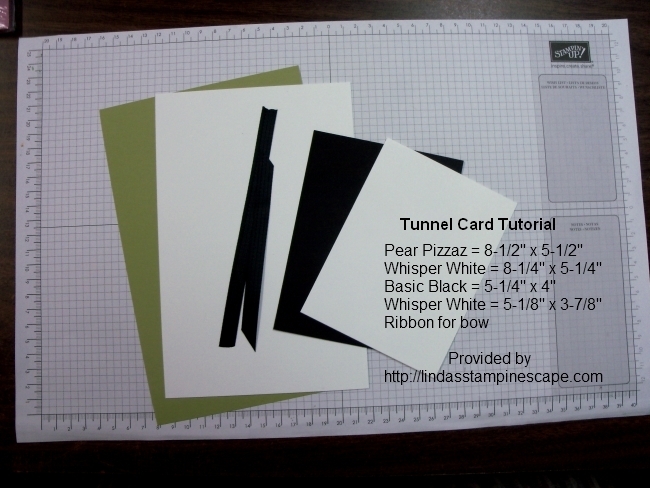 I am back today to share more Tunnel cards with you! The first three are the cards we made in our Technique Club this month. They all have the same layout, but I used different colors to match the Designer Paper “Cherry On Top”. The last card will be a spin off of the original Tunnel Card I shared. I used the same paper, dimensions, ribbon … I just switched out the stamp sets. 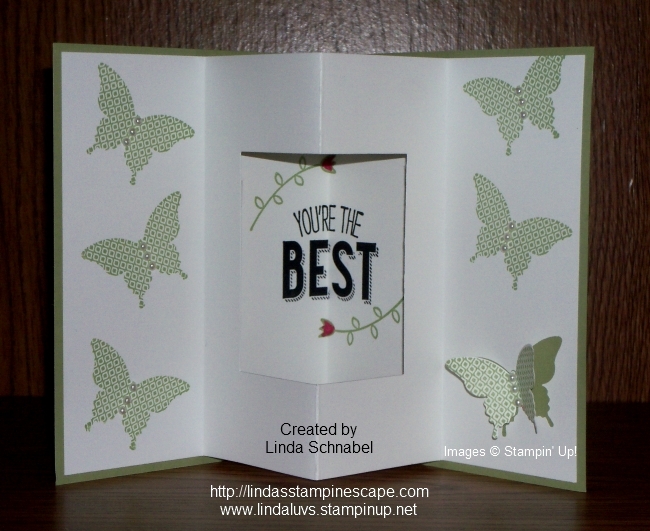 AND instead of stamping on the inner flaps … I used the Elegant Butterfly Punch. This is our Cucumber Crush “In-Color” teamed up with Melon Mambo. The greeting and inside verse comes from the “A Whole Lot of Lovely” Hostess stamp set. The inside layout is also the same on all the cards so I’m just showing the Cucumber one today. This was made with the “Crushed Curry” cardstock with a touch of Marina Mist. For my last card with the same layout, I used Bermuda Bay with just a hint of the Crushed Curry. NOW … Combine those with our “Friendly Wishes” stamp set and this is what I came up with. As you can see, I added a butterfly from Papillion Potpourri and the Elegant Butterfly punch to catch your eye! The inside has been stamped with the butterfly too but the bottom right has been punched out to create some awesome texture. Inside greeting also comes from the Friendly Wishes stamp set. Hope you enjoyed the additional samples, and thank your for stopping back to check them out. Have yourself a fabulous Friday!! Sorry I missed you yesterday but the flu bug caught me … not surprised with the weird weather we’ve been having! One day it’s almost 70° and the next it’s 34° and slushing outside … YUK!! I’m sure that all of us here in Wisconsin are wondering where Spring is?? Even the robins look confused! 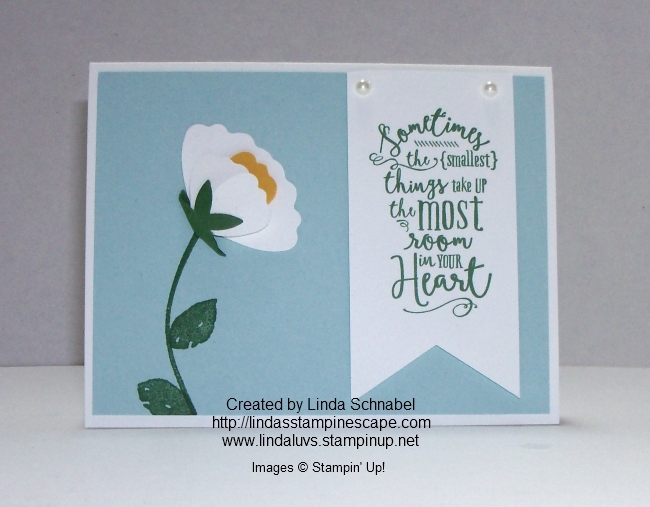 Anyhow … I have a special card I’d like to share with you today, it’s a Birthday card I got from one of my stampers: Linda K.
Don’t you just love the big bold flower! It is amazing what we can do with punches. The layers of browns are beautiful and then the pop of Delightful Dijon (or may have been More Mustard) really draws you into the card … Love it! 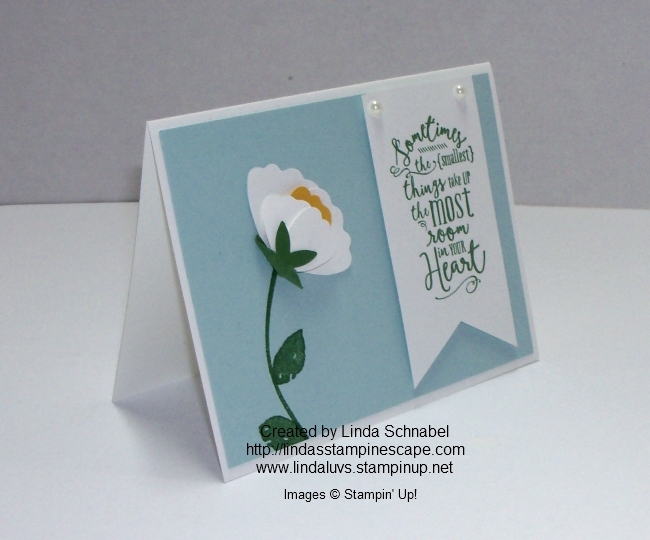 This is an easy card to make with just a few punches, but with the detail in layering, Linda made this card look stunning. You’ll also notice the pop of the newsprint designer paper … so handy to have around because it works great on so my types (man, women, birthday, etc.) and styles! Hope you enjoyed today’s card share as much as I did receiving it! Thanks again Linda for such a beautiful card, and to everyone else who reached out on my birthday. Much appreciated… sure know how to make me feel special. 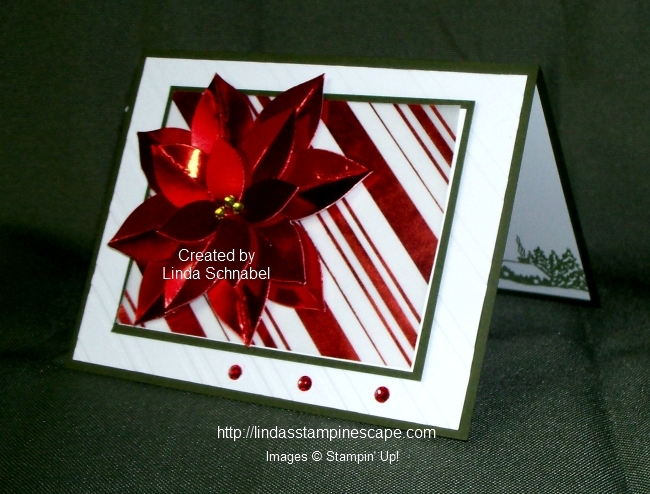 Today I have a lovely card to share with you that I created for our 2015 Holiday Stampin’ Retreat last weekend. 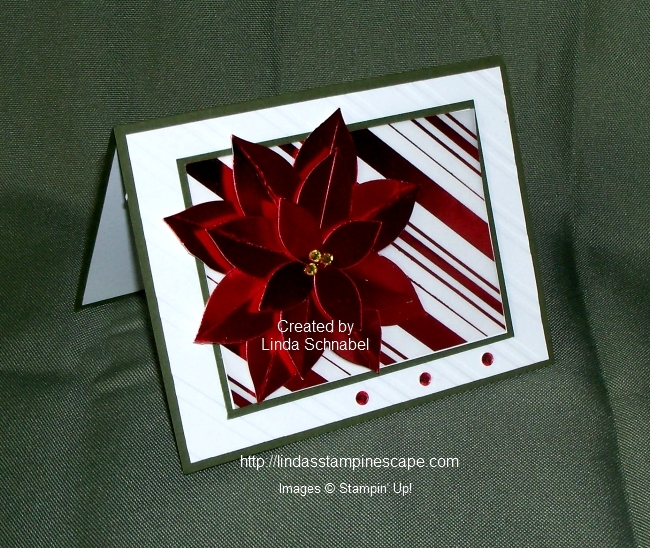 Not sure if I could pick a favorite but this one was at the top … I think it’s the beautiful red foil poinsettia. 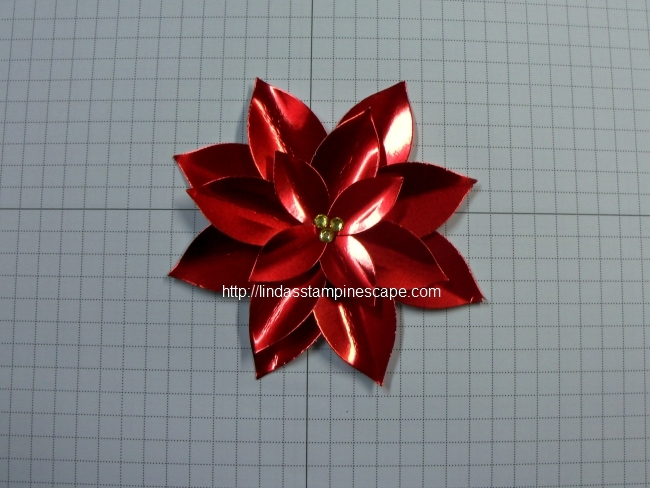 I will take you step by step as I create the poinsettia from our “Festive Flower Builder” punch and used on my card …. 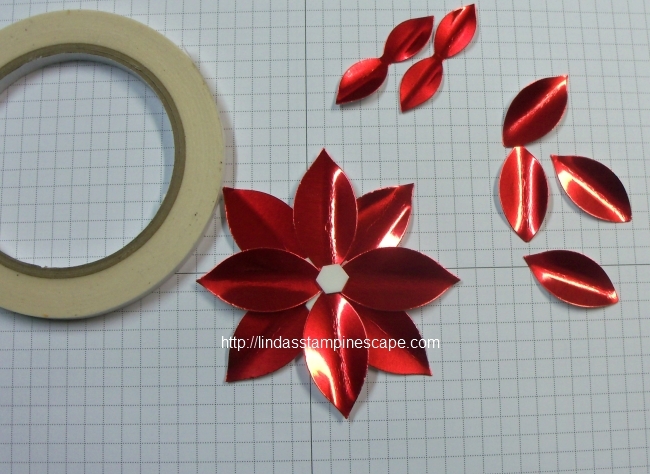 First let me begin with the how many pieces I used to create the flower and how I cut my cardstock. I use 1 – 3″ x 6″ piece and 1 – 1-1/2″ x 6′ piece of cardstock. You will punch a full punch on the larger piece twice … then punch 2 more smaller petals and 1 large petal from that piece. 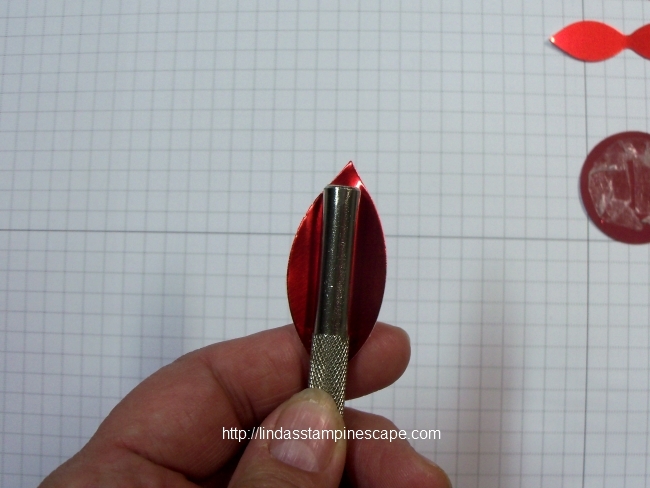 On the smaller piece you will be able to easily punch 5 more larger petals for a total of 8. You need 8 – larger petals, 4 – small petals, 2 double petals (which you will get when you fully punch). You will also need a circle punch as a base. You can see mine is full of the Tear & Tape adhesive. Before I begin assembling … I get a little curl by using my Paper Piercing tool. 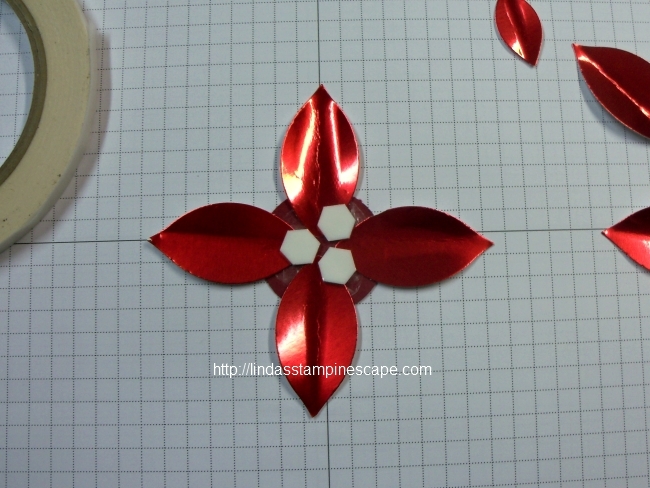 Next I take the circle base and adhere 4 of the large petals directly onto the base. I add 3 dimensionals on top of the petals in the center to create lift and to help hold it together. Now layer the next four large petals onto the dimensionals and place them between the first set of petals you placed on your base. I adhere the petals so they almost touch each other in the center. Then I place one dimensional in the center. The next step is to place the double petal into the center and between the last layer of petals. Before I place the last double petal onto the stack, I add a glue dot to the center to ensure that it holds together well. To finish off the poinsettia, I colored the Rhinestones yellow with my Blendabilities but you can easily use a Sharpie. I just figured I would use what I have handy at home. Ohhhh … isn’t it pretty!! 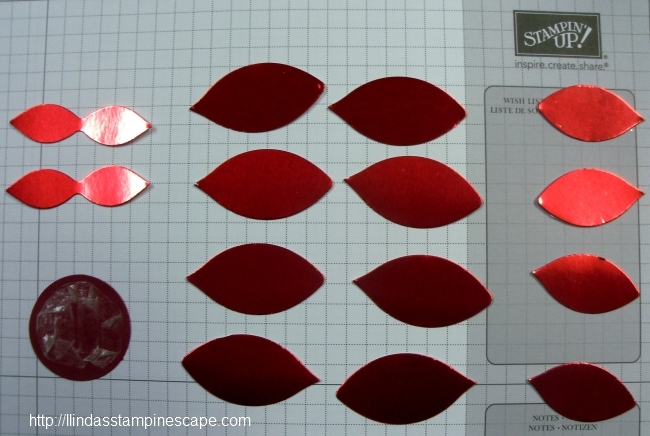 We did the poinsettia in the red foil and red glimmer paper! It’s hard to see from this photo but the Whisper White is actually embossed with the “Stylish Stripes” embossing folder and then the center was highlighted the beautiful “Holiday’s Fancy Foil Designer Series Vellum”. I love all 3 of the patterns in the vellum!! 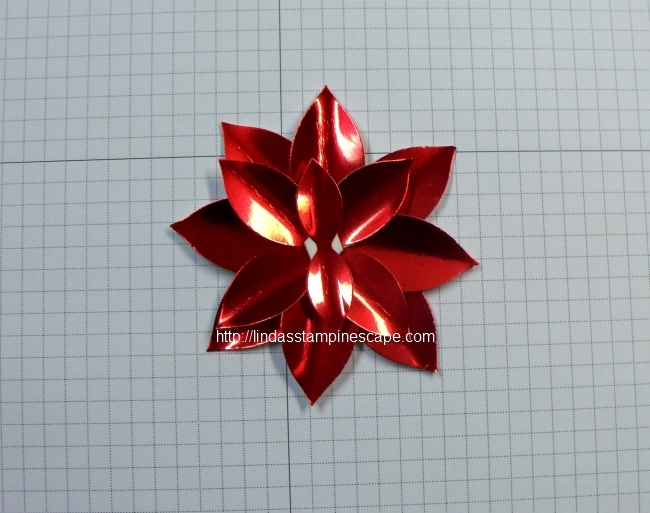 The poinsettia is then attached to the vellum area with dimensionals. I finished off the card with rhinestones that I had colored red. If you take a peek on the inside of my card … you will see the homestead from the “Cozy Christmas” stamp set. I really love these pretty flowers, and once Christmas is over, you can begin your “spring” garden of flowers! I’ve been making quite a few over the last few days so we can finish off our cards. Thank you for sharing a part of your day with me!